The Conservative Party’s first poster of the 2017 general election campaign is likely to end up as friendly fire. 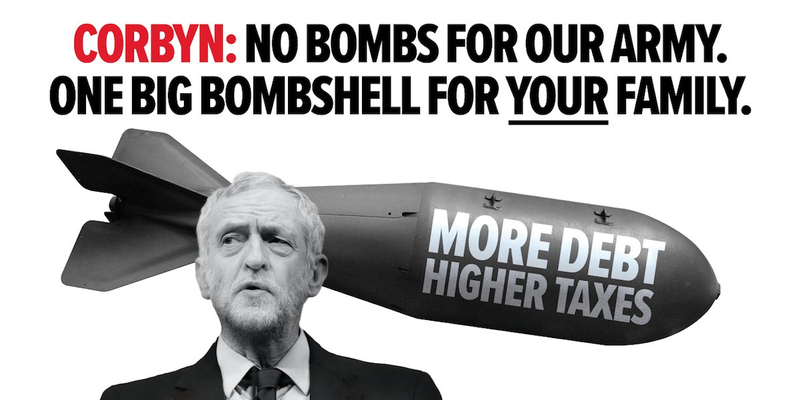 The Conservatives have released a poster which simultaneously attacks Corbyn’s pacifist beliefs and the Labour Party’s taxation and spending plans. – There are too many words in the headline which makes it feel laboured. – The need to reference Corbyn in the headline and the underlining of “your” help contribute to a lack of poise. – The use of two unrelated stock images makes it feel cheap and cobbled together. But there are also problems with the concept as a whole which mean that people are likely to react badly to it. With any campaign attack, there is an element of backlash on the sponsor; an intake of breath and a feeling of “bit harsh” is impossible to avoid completely. As this is the case, any negative messaging has to be designed so that the net outcome is favourable. The first way to minimise backlash is to only “go negative” on issues where the audience is predisposed to the message. In this instance, whilst the audience may agree that Corbyn’s tax and spend policies will be bad for the country, few people take glee in the idea of the army bombing people. The use of bombs by the army is something most voters will consent to with regret and only when they feel it’s the last option. In some senses they will sympathise with Corbyn’s hesitance to use the military and so it’s not a topic they will appreciate a political party making light of in a poster. And, the second way to reduce the chance of voter backlash is to make attacks lighthearted in tone – or at least clever – so as to reward the viewer in some way and reduce the sting. This poster roundly fails on that front. It’s not funny and it’s not clever. There’s an attempt at wordplay around the repetitive use of the word bomb, but “bombs” and “bombshells” are different words so it falls flat. I suspect this is one is going to land badly.